Partners Reza Ebrahimi, Patrick Fife and Bryan Van Cott of Twomey Latham’s Business Law Team, recently presented at and sponsored Long Island Metro Business Action’s (LIMBA) January 5th meeting, focused on the state of the County and new initiatives. Deputy County Executive Jon Kaiman was the events keynote speaker, and he spoke about the County’s effort to save money through its new shared services initiative. 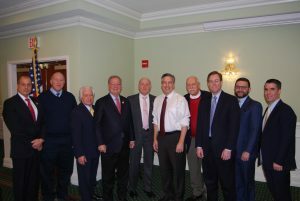 Since 1968, LIMBA has been Long Island’s catalyst for economic investment and improvement, sponsoring breakfast forums featuring Long Island business activists and government officials. Pictured (left to right) James P. Johnis, President and Chief Operating Officer, Gold Coast Bank; Frederick C. Johs, Partner, Lewis Johs; Bill Miller, Treasurer, LIMBA; John Tsunis, Chief Executive Officer, Gold Coast Bank; Ken Nevor, Member, LIMBA; Suffolk County Deputy County Executive Jon Kaiman; Ernie Fazio, Chairman, LIMBA; Bryan Van Cott, Reza Ebrahimi and Patrick Fife, Partners, Twomey Latham.